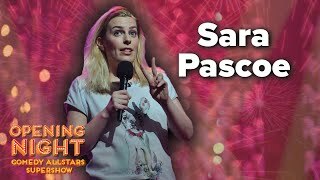 Nominated for best show at the 2014 Fosters Edinburgh Comedy Awards and winner of the 2014 Chortle Breakthrough Award, Sara Pascoe has been working as a comedy actor, sketch performer, improviser and writer since 2006, when she joined the Newsreue topical sketch show. She started stand-up in late 2007 and the following year was a runner-up in the Funny Women competition and placed third in the So You Think You're Funny? new act competition. In 2009, she had a regular role in the Channel 4 sitcom Free Agents as the disrespectful assistant, Emma. We do not currently hold contact details for Sara Pascoe's agent. If you are a comic or agent wanting your details to appear on Chortle, click here.